Thomas Joseph Dudley, USMC died in Afghanistan during combat on July 7, 2011. He was 29 years old, married, and had three children. He was laid to rest in Rock Hill, SC on July 15, 2011 amid an outpouring of patriotism and support for his young family. During Staff Sergeant Dudley’s funeral, his young son, in short pants, gazed at his father’s coffin as four Marines and two volunteer fire fighters in dress uniforms carried the American-flag-draped casket into the blazing heat. The little boy was obviously oblivious to the horrific experience of his father’s funeral, as he flitted along the row of auditorium seats and sat on the laps of friends and family members. His bobbing, blond head brought me to tears as he walked up the aisle staring at the hundreds of people gathered to honor his fallen father. I was a proud Marine reservist in my youth. I will always be a Marine! A sea of Dress Blues at Staff Sergeant Dudley’s funeral gave me chills of pride. As a mother, I’d be honored, though fearful, for my child to join the Marines. Yet, I do believe that each American should have compulsory service after high school. Today people have little concept of what it has taken and continues to require for us to be able to have a career and a family and live in peace. For some, patriotism means bashing America. For others, patriotism means nothing, absolutely nothing. For many it’s a vague ideal and fireworks on July 4th. However, the combat deaths of SSgt Dudley and millions of other men and women, along with the service men who survived, though wounded, call us, each American citizen, to patriotism. Freedom does not equal licentiousness and “love” is not of the “free love” variety of the ’60s and ’70s! To love means that our human dignity grants us the right and the ability to choose the good over the evil every time. That is the true freedom for which SSgt Dudley died. It is the freedom of which Saint Paul writes, “It is for freedom that Christ has set you free”. As Americans we are free to love. In the smallest detail of family life, or on the highway, or in the office, we honor SSgt Dudley by choosing to love. Think of him and chose not to snap at the annoying comment of your spouse. Refrain from yelling at the distracted driver. Empty the coffee grinds at work even if you did it yesterday. Love means sacrificing and giving, for the other, whether that person is your fellow citizen or spouse or child or enemy. Love until you feel the burn! There is no room for petty squabbles among free citizens. Freedom costs too much! Enemies of freedom rely on adults who refuse to grow up! Our country, and the brave people who serve us and die for us, deserve a more profound response than the waving of an American flag along the roadside. We must sacrifice our fallen nature and intentionally train ourselves in love. Daily life is Parris Island for us. The enemies of love are many. We weaken our flanks by allowing the inconveniences of life to wear us down; but they are as nothing compared to eating MREs in the field for weeks or missing your deployed husband for months on end. We hand our country and ourselves over to defeat by succumbing to impatience and quick irritation and maybe even retaliation. Fight on, for love of God and country! Persevere in battling self until it hurts. SSgt Dudley lived duty and died performing his duty as a US Marine. As a volunteer fire fighter, I’m sure he never hesitated in entering a burning house. His sense of duty required him to give his all: even his life. Duty binds us as citizens of this country to certain behaviors, which are summed up in the Ten Commandments. Yes, the Commandments are extraordinary, yet simple and intuitive too. For instance “Thou shalt not steal”, who can argue with that? Yet many American citizens — from corporate board members, hiding behind the corporate logo, to families bequeathing generational welfare to their children under the guise of “we’re owed”, to children leaving the lights on and the doors wide open, because mom is too worn out to catch them — steal resources by “working the system” for their own selfish concerns. One of the last dutiful actions of SSgt Dudley was to quietly place two cases of energy drink into a helicopter headed out to fellow Marine’s in the field! Several hours later, he gave up his life defending our freedom to be patriotic Americans. Few, except for those trained in the Way of Duty, incarnate that word. For most it means little and plays no role in directing their actions. As Americans we live our duty in accord with our state in life. Children live duty by obeying parents and studying hard. A good motto for them is: “Americans don’t lie, cheat, or steal”. Cheating on a test in school is unpatriotic. So is Facebook negativity. Husbands and wives are patriotic Americans by honoring their marriage vows. Simple things, like seeking and asking for forgiveness when you’ve run the gas-tank down to “E”, or forgotten to pay a bill are a duty of marriage and of citizens. A patriotic employee performs his duty by not checking personal email at work, for example. In little ways, we can serve our country and perform our duty. Living a dutiful life reminds us that we are not the center of the universe. As citizens of a free society, each generation has an obligation to enflesh Thomas Jefferson’s belief: “We hold these truths to be self evident. That all men are created equal, that they are endowed by their creator with certain unalienable rights, that among them are the right to life, liberty, and the pursuit of happiness.” The Declaration of Independence transcends any one person’s individuality, while simultaneously protecting the human person. The Declaration’s lifeblood, however, is the duty incumbent on each person to continually build up America by living it’s ideals, even in small ways, and thereby honor those Fallen. SSgt Dudley paid the ultimate price so “Liberty”, ringing from the Declaration of Independence, may always resound in our halls, but even more clearly in our hearts. It is a blessing to be able to pursue happiness, and that gift flows to us via the blood shed by our Forefathers in Freedom and by Marines like SSgt Dudley. Therefore, a way to thank these selfless people is to do your job well, and to give back to your community. Many of us live lives of patriotism through our various callings in life. However, when a fallen hero returns home or volunteer firefighters battle a blazing house two doors down from you, it is an appropriate time to reevaluate how you are living the sentiment of patriotism. I consider myself a patriot for bearing and raising 12 children to the glory of God and country. On September 11, 2001, I was praying the Rosary (a prayer for peace) with my children at the time I heard the horrific news. At the exact moment that Osama bin Ladin was killed, my entire family was in church praying for God’s Divine Mercy on the world. What a grace to be found at prayer during these times. A patriotic duty is to pray for our country every day. Two weeks after 9/11, and 8 weeks pregnant, I found myself bawling in the car while listening to a radio story about the victims. I asked God, “Why am I bringing more children into this God-forsaken world?” His answer was clear, “Children are a sign of hope. I have overcome the world!” Lydia Hope, my 8th child, was born 7 months later. As Americans we have stopped having children. Without the arrival of immigrants, our population would be declining as it is in all of Godless Europe and the former Eastern bloc. Are we so hopeless and materialistic that we limit our family sizes to unsustainable numbers? Children are a blessing. God will provide. He gave us SSgt Dudley to defend our country. Perhaps that hero learned his selfless love for others by first learning to live a life of duty and service in his family of 14 children. We will never know exactly how his large family shaped him as a citizen. However, his life’s actions bear witness to his family. As a former Marine reservist, I consider myself a patriot. But I must serve more! 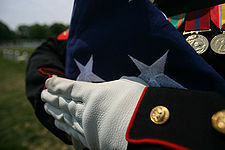 A Marine at SSgt Dudley’s funeral said, ” I judge people by how they serve, not on their potential to serve.” In that spirit, I’m reevaluating my patriotism. I’ll be bringing cases of water to the volunteer fire department monthly. I’m going to donate most of my monthly VA benefit to Bill O’Reilly’s Wounded Warrior foundation. I will continue my patriotic duties as Mother by reading to my kids, listening to their stories, taking them to their activities, cooking their nightly meals, and loving them tenderly. We’ll eat as an entire family most nights and wash dishes until after 9pm. All the while, I’ll carry SSgt Dudley’s beautiful smile in my heart, praying for his wife and three children. Whether you serve your country in the military or otherwise, serve. Serve honorably and with love. It is your patriotic duty and privilege. Thank you to all service men and women. Thank you to all the families waiting and praying stateside. Thank you to all wounded veterans. To all our fallen men and women, I hope you hear my prayer of thanksgiving. May we Americans live up to your ultimate sacrifice. Staff Sergeant Dudley, Semper Fi! Thank you. As a retired veteran thank you for writing about embracing patriotism. Patriotism is an act of love. Love for family. Love for one another. Love for Country. Today we have lost of forgotten in many cases what patriotism is all about. The young men and women that choose to serve to today are choosing that by themselves. God bless them all. My youngest son is among that number. But our respect for our service members really started to go “downhill” in the 70’s I believe. Here is what happened to me years ago. In 1975 I was returning from a short tour of duty in South East Asia. Due to the circumstances of leaving where I was, I had to travel in my jungle style fatigues. While waiting in SF International Airport for a flight back to home base, I became the “target” of a Hari Krishna group of young men with shaved heads wearing what looked like a bed sheet. No matter where I went or turned they were all around me. It was really starting to bother me. I could not even get any help from the Airport Police standing nearby. So when I could no longer handle their “undivided attention, my anger got the best of me. I picked up one of the young men and deposited him head first into a nearby trash can. Two lessons were learned in a short amount of time. 1.) Hari Krishna types don’t wear anything under that bed sheet. 2.) Depositing a Hari Krishna in a garbage receptacle of any type gets you arrested.